Please enter your details in the form below. This guide is not personalised advice. This guide is not personalised advice. 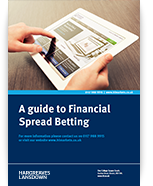 Spread Betting carries a high level of risk and you can lose more than your initial deposit. It is not suitable for everyone; ensure you understand the risks and if in doubt seek advice. This guide is not personalised advice. Spread Betting carries a high level of risk and you can lose more than your initial deposit. It is not suitable for everyone; ensure you understand the risks and if in doubt seek personal advice.